GIS has an important role to play in marine aquaculture development and management. 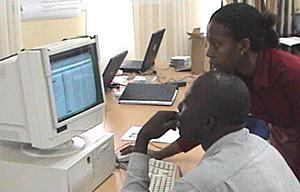 Use of the technology has already proved helpful in making better use of scarce resources in Africa. A geographic approach will help tremendously with alleviating poverty and hunger in developing nations. Give a man a fish and he will eat for a day. Teach him to use GIS and he will develop informed, sustainable practices in aquaculture and inland fisheries management. 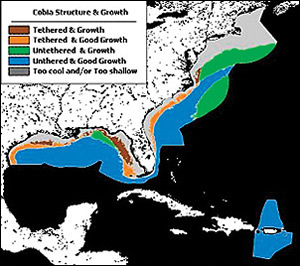 Suitability for cobia culture in terms of culture structures and growth in the Atlantic, Gulf of Mexico, and Puerto Rico-U.S. Virgin Islands Exclusive Economic Zones. Aquaculture plays an increasingly important role in the global economy, and fisheries contribute significantly to poverty alleviation and food security. The Food and Agriculture Organization (FAO) of the United Nations has worked for decades to promote sustainable aquaculture and fisheries in developing countries. FAO was set up in 1945 to fight against world hunger and malnutrition. The need for such an agency became clear during World War II, which damaged agricultural production, transportation, and marketing systems in many countries. Since then, the significant growth of the world's population has added urgency to the need to increase food supplies, improve the nutritional quality of food, and make supplies accessible to more people. Since aquaculture and fisheries are fundamentally spatially distributed, and because many of the issues that relate to them are spatial in nature, responsible management requires a solid understanding of the underlying spatial dimension. GIS, remote sensing, and mapping provide the technology to assess suitability of site and zoning, migration of resources, transportation networks, markets, and habitat quality and quantity linked to plant and animal abundance and distribution. "There are many opportunities to use GIS to improve the sustainability of aquaculture and inland fisheries," says James McDaid Kapetsky, an aquatic expert currently consulting at FAO. "Unfortunately, the widespread use of these tools is impeded by limited awareness of their benefits and unfamiliarity with how they can be deployed. GISFish was created to help overcome these impediments." 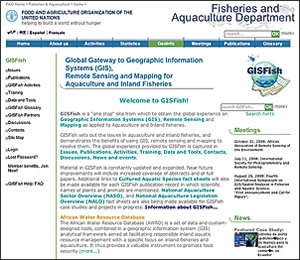 To meet the new set of challenges, FAO created GISFish, a one-stop Internet site for GIS-based resources for aquaculture and inland fisheries in developing countries. The mission of GISFish is "solving problems in inland fisheries and aquaculture using GIS, remote sensing, and mapping." The site sets out the spatial issues addressed most frequently in aquaculture and inland fisheries and uses GIS to resolve them. Suitability for small-scale farming and potential yield (crops/y) of Nile tilapia, African catfish, and common carp. 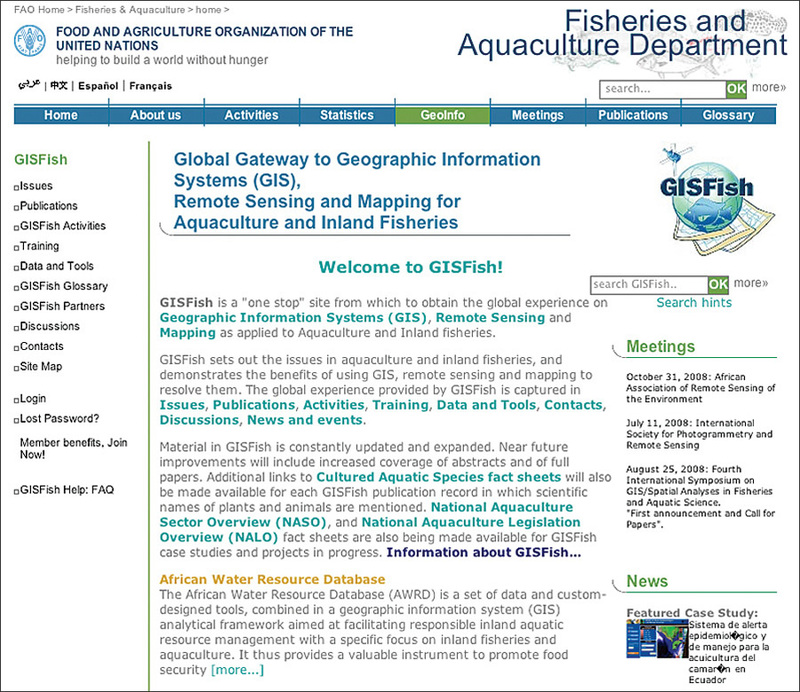 More than 15,000 visitors have viewed the publications section of GISFish since January 2008. There are 167 GISFish members from 58 different countries, including many African nations. 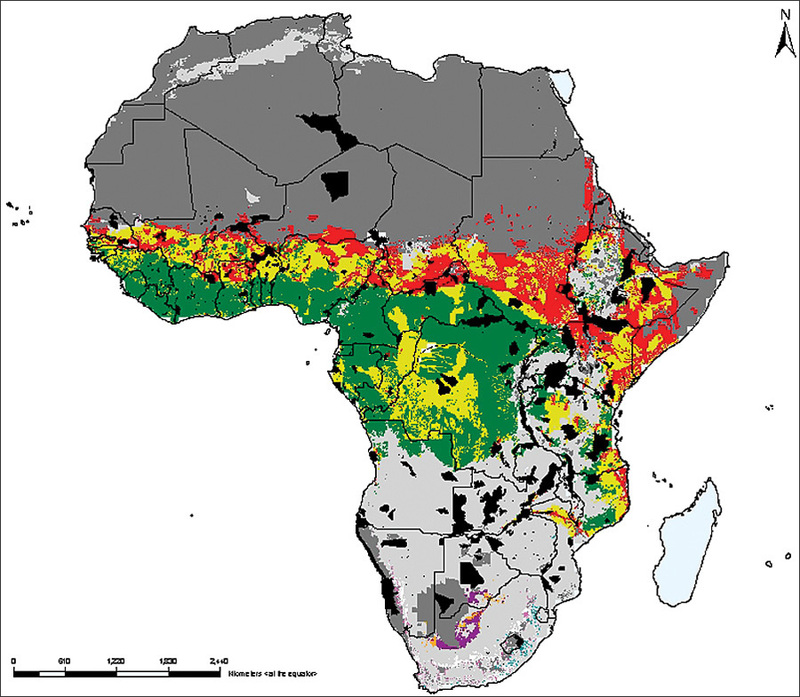 More than 300 different GIS datasets, mainly from an African water resource database, have been downloaded from the site. The overall number of downloads from GISFish is more than 10,000. "It isn't always understood just how many people in Africa and the rest of the developing world depend on inland fisheries," says Jos� Aguilar-Manjarrez, fishery resource officer with FAO. "Good management of this resource is crucial. It can't be done unless scientists can see what is really happening to the fish." The use of ArcView has proved helpful in making better use of scarce resources in Africa. Strategic assessments of fish farming potential on the continent have been carried out by FAO in the past (1994 and 1998) using GIS to stimulate and/or support the development of (a) national level studies to improve planning in those countries with relatively large potential for fish farming development and (b) comprehensive plans for technical and financial assistance by FAO and other national and international organizations, as well as national governments and financing institutions. "The basis of these assessments is in many ways similar to traditional studies for assessing aquaculture development. The primary difference is that the use of a GIS greatly enhanced the evaluation," says Aguilar-Manjarrez. "Most certainly, one of the greatest advantages of GIS over manual techniques is the capability to quantify the predicted potential." Facilitating the use of GIS, remote sensing, and mapping through easy access to comprehensive information on applications and training opportunities. GIS, remote sensing, and mapping have an important role to play in all geographic and spatial aspects of marine aquaculture development and management. Satellite, airborne, ground, and undersea sensors acquire much of the related data, especially on temperature, wave current velocity and height, chlorophyll concentration, and land and water use. ArcInfo and ArcView are used to manipulate and analyze spatial and attribute data from all sources and to produce reports in map, database, and text format to facilitate decision making. The technology is also opening new doors for fish farmers. "The open ocean is seen as a new opportunity for the seaward expansion of aquaculture," Kapetsky adds. "GIS could be used to assist developing countries estimate their open ocean aquaculture potential while at the same time increase their capacities for spatial analyses in support of open ocean development and management." In 2007, Kapetsky and Aguilar-Manjarrez conducted a reconnaissance study, available online at the GISFish site, that illustrates how downloadable data can be used with remote sensing and GIS to estimate open ocean aquaculture potential in countries' exclusive economic zones (EEZs). Development of GISFish is carried out under the guidance of FAO's Aquaculture Management and Conservation Service (FIMA) and a number of collaborating institutions. The material in GISFish is constantly being updated and expanded. The number of abstracts and full papers is being increased, and additional links to Cultured Aquatic Species fact sheets will be made available for each GISFish publication record in which scientific names of plants and animals are mentioned. National Aquaculture Sector Overview (NASO) and National Aquaculture Legislation Overview (NALO) fact sheets are also available for GISFish case studies and projects in progress. And sharing of experiences by site users is promoted through online discussions and postings about ongoing projects. FAO's FIMA continually seeks opportunities to cooperate with other organizations in the realm of GIS, remote sensing, and mapping, particularly in the area of training, to improve the sustainability of aquaculture and inland fisheries. For more information, contact Jos� Aguilar-Manjarrez, fishery resource officer, Food and Agriculture Organization of the United Nations (e-mail: jose.aguilarmanjarrez@fao.org), or James McDaid Kapetsky, consultant, Consultants in Aquaculture Sciences and Technologies, Inc. (e-mail: cfastinc@bellsouth.net), or visit GISFish on the Web (www.fao.org/fi/gisfish).